How many times did you see a cute puppy and wished for it to remain in this state of the rest of its life? Many dog enthusiasts would like to have a dog that looks like a puppy for as long as possible, as they find their companion cuter this way. Well, if you plan on getting a dog for a while now and you’re in search for the ideal breed of dog, you may want to know more about teddy bear dogs. While this is not actually a dog breed, teddy bears are those breeds of dogs that look like pups in their adulthood years as well. Sometimes their coats may need a puppy cut for this, but with a bit of trimming and their lovable personalities, they will indeed resemble a teddy bear. What dog breeds are considered as teddy bear dogs? Teddy bear dogs are small breed dogs with a cuddling appearance that don’t get through too many changes on their way toward adulthood. In other words, they will still look cute and lovable even after one year of age or more. Teddy bear dogs can be pure dog breeds or mixed breeds because as long as they respect the set of features that make them look like a teddy bear, they are considered part of this group. Thus, the Pomeranian, Shih-Tzu, Poodle, Bichon Frise, and mixes of these breeds are usually the teddy bears of the canine world. We will talk in the following lines about the most important traits of teddy bear dogs, so you will know what to look for when searching teddy bears for sale. So, between what prices can I find teddy bears? The price of a teddy bear puppy can vary a lot, as it depends on the dog’s breed and particularities. Every puppy is different and has a certain genetic lineage, so this can influence, more or less, its price tag. Just how much the value varies when it comes to teddy bear dog prices? Well, there are teddy bears with prices that start around $500 and teddies that can cost as much as $3000. So, you should think well how much you want to spend on the acquisition of a teddy bear puppy, as the offer can be quite diverse, as you can see. Of course, you should focus on finding reliable and responsible dog breeders that can give you a healthy puppy, instead of looking at price tags. Whether we are talking about pure breeds or mixes, puppies can always suffer from health problems and genetic disorders if the breeder is not a responsible person. Thus, spend a sufficient amount of time checking out the dog breeder and on acquiring sufficient proof that his or her dogs are healthy and that breeder is worth your trust. Do teddy bear dog shed? This aspect depends, once again, on the dog breed or breeds, if we are talking about mixes, which provided the genetic material of the teddy bear puppies. If the teddy bear puppies are coming from dog breeds known for their low-shedding, hypoallergenic coats, then your teddy bear dog will shed very little. If you are interested in a low-shedding dog breed, look for teddy bears coming from Poodles or Bichons. If the teddy bear puppy comes from Pomeranian parents, for example, or has at least one parent from this dog breed, its coat may end up shedding a bit more and will require a higher level of maintenance. Of course, there are other dog breeds besides the Pomeranian that will need a bit more attention when it comes to grooming. But, if you will opt to get your dog’s coat trimmed and shortened, this problem will not that bothering or time-consuming. How big does a teddy bear puppy get? A teddy bear dog breed is a small dog breed, so this type of dogs will never grow too large, remaining in the miniature section. Practically, this is why they are seen as teddy bears because they are small and cuddly. Again, the adult size of your teddy bear puppy will be determined by the puppy’s genes. So, it is always more than recommended to ask the dog breeder questions about the puppy’s parents. In fact, if possible, it is a good idea to ask the breeder to allow you to see the parents. This is even more important when we are talking about mixed breeds when one of the parents can be slightly larger than the other. Getting sufficient information about the puppy’s parents will give you a clear image of how large your teddy bear puppy will be in the end. Of course, you need to collaborate with a responsible and trustworthy dog breeder if you want to be sure that you’re getting the ideal puppy. So, do your best to avoid scammers. Now that we covered all of these aspects, let us look closer at the most important traits presented by the lovable teddy bear dogs. Teddy bear dogs got their reputation as live teddy bears precisely because they are small in size and could easily fit in someone’s arms. 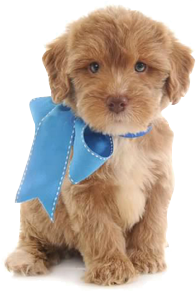 Of course, there are some exceptions, such as the miniature Goldendoodle, which is a mix between the Golden Retriever and Poodle. They are slightly larger than most of the dog breeds that belong to the teddy bear group but don’t expect them to grow too large. Still, if you like a teddy bear with a more generous size, the Goldendoodle will be just what you need. Other teddy bears, on the other hand, will be so small that you’ll be able to carry them in a handbag. Thus, in the end, it’s more a matter of personal preference. A teddy bear dog must have a soft and fluffy coat. So, in most cases, teddy bear dogs will have a medium-sized coat that can be wavy or slightly curly. Again, the dogs that contributed to a puppy liter will dictate the coat type of the puppies. Of course, when we are talking about mixed breeds, some puppies will inherit the particularities of their parents’ coats more or less. For example, a Maltipoo puppy, which resulted from the crossbreeding of a Maltese with a Poodle, can have wavy or curly hair. Also, the puppies from the same litter can display different coat particularities, so you will enjoy a high degree of diversity when picking your puppy. Even if your puppy will end up having a long coat as an adult, you shouldn’t worry about it, as you can always give it a puppy cut. When you look at a teddy bear dog, you should have the impression that you’re seeing a plush teddy bear in front of your eyes, not an actual dog. This is why these dogs will have nice rounds heads, a rather short snout, and a button nose. They will preserve their puppy look during their adulthood as well, especially if, in some cases, you will trim your dog’s coat. Practically, this is what some people want and the teddy bear dogs will have what it takes to suit their needs. The best part is that they will have a puppy’s personality as well, being playful and energetic until a very old age. Teddy bears have small ears, right? Well, teddy bear dogs have the same cute and small ears. Every detail of this type of dog’s head will make it look like a toy that came to life. A teddy bear dog will never have bulky features or a heavy appearance. They are appreciated for their adorable puppy look regardless of their age. If you are in search of this kind of dog, a teddy bear will definitely not disappoint you. Like mentioned before, teddy bear dogs are very friendly dogs that simply love being together with their owner and family. These dogs are usually not aggressive, at least not to humans, as long as they receive proper training and education. They may look like teddy bears, but you need to bear in mind that they are dogs and they will need to have a pack leader and be trained right. Also, it is worth remembering that certain teddy bear dog breeds don’t enjoy being left alone for too long. They can get rather stressed if separated by their owners for long periods and develop the separation anxiety disorder. So, it is worth getting all the information concerning the dog’s personality from the breeder, to see if you and your future dog will be a perfect match. So, if a teddy bear dog breed is what you need, you have to start by finding a responsible dog breeder that is capable of providing healthy puppies. Teddy bear dogs are great companions, very loyal, perfect for living in an apartment if they get walked and played with, and with low maintenance requirements. If you don’t know where to look for teddy bear puppies for sale, it is worth checking out the website of Premier Pups. Only the most reliable dog breeders have the chance to sell their puppies on this website, which is dedicated to connecting dog lovers with the perfect puppies. Can Dogs Help You Lessen Your Stress?